Today, we have a bit of a riddle for you. â€œWhen fine art, politics and Sea Island real estate meet, what do you get?â€ The short answer is, â€œAn incredibly good time.â€ At least it should be the response for those that choose to attend an upcoming showing of Winston Churchillâ€™s artwork. The preview is slated to be held on Sea Island in mid August, from the 15th until the 19th. Itâ€™s actually all part of the lead up to a fall exhibition opening thatâ€™s due to take place at Atlantaâ€™s beloved museum, The Millennium Gate. The exhibition is noteworthy on several levels. For starters, it is anticipated to include work that has never been seen by the general public. Itâ€™s also likely to include photos and other unique items that attendees would be hard-pressed to find elsewhere. That said, many art-loving, Sea Island real estate owners are understandably excited about being able to view Churchillâ€™s work first, on their home turf. And thereâ€™s more to be excited about too. The five-day event is also expected to include both a question and answer session and dinner with the late world leaderâ€™s great-grandson. Thatâ€™s slated to take place at The Cloister Clubroom and Wine Cellar the evening of the 16th. The paintings, on the other hand, will be available for public viewing in The Cloister Spanish Lounge for the entire length of the event. 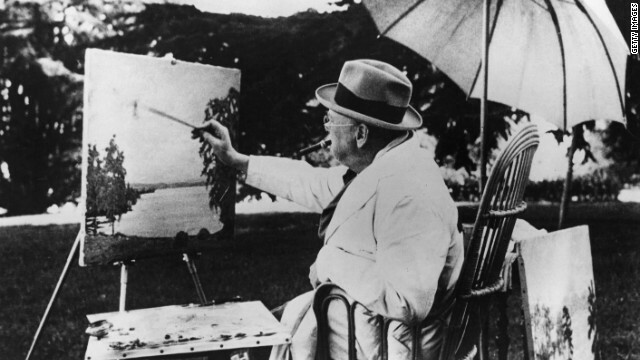 Advance reservations for all of the individual activities associated with the five-day homage to Churchillâ€™s artistic side may be made through the resortâ€™s staff. On a side note, the August event is not the first time that one of Winston Churchillâ€™s kin has set foot onto Sea Island real estate. In 1949, his daughterâ€™s nuptials were held here at, you guessed it, The Cloisters. You can read briefly about it, and the other famous people that have set foot onto Sea Island real estate in R. Edwin Greenâ€™s book, St. Simons Island: A Summary of Its History. Donâ€™t let the bookâ€™s title fool you. It includes information on both islands and should be an entertaining read for Golden Isles history buffs as well as Winston Churchill fans. For more intriguing information about Sea Island real estate and its longstanding connection to dynamic world leaders, please contact us at DeLoach Sothebyâ€™s International Realty.